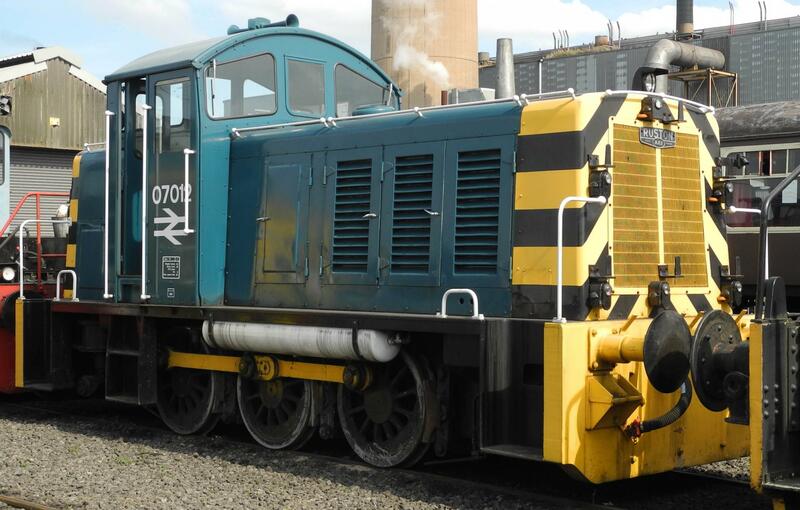 Danish manufacturer Heljan have made a new year announcement that they are to produce a Class 07 Diesel electric shunter in 00 gauge with a release anticipated in 2017. Introduced in 1962 this class of 14 locomotives was designed specifically for use in the Southampton Docks complex, replacing the SR USA class of 0-6-0T steam locomotives (which are being produced as Model Rail magazine commission by Bachmann). The locomotives were a modified version of a standard Ruston and Hornsby design. They had a wheelbase of only 8′ 7½” and were powered by a Paxman 6RPHL Mk III six-cylinder diesel engine, rated at 275 hp at 1,360 rpm., compared with 11′ 6″ in for the larger 350hp English Electric powered 08 class, which made them ideally suited for use within the docks and its associated tightly curved trackwork. They were originally numbered D2985 – D2998 and became 07001 to 07014 under the TOPS numbering scheme. Initially, the locomotives were finished in dark green livery and carried British Railways badges of the type use on coaching stock. All were later painted in the standard BR blue. With the decline of traffic within the docks the class was re-assigned to duties in the Eastleigh area before withdrawal, that commenced in 1973 with many finding work with a number of industrial companies, including 07009 that ended up in Italy. Six examples are preserved. Two versions will be produced reflecting ‘as-built’ condition and later modified locos with waist height air brake connections. Rumours of Heljan producing this model have been around for a while now so it is nice to have it finally confirmed. Heljan have made a bit of a niche for themselves producing some of the smaller and slightly obscure classes of locomotives and this is a welcome addition to the range. Further details of liveries and numbers etc. will be announced as the project develops. With Dapol having announced the ex LSWR Adams B4 0-4-0 tanks and the SR USA tanks already mentioned above, the Class 07 completes yet another era of Southampton Dock locomotives that will be available in 4mm scale.